When your laptop breaks and you can’t afford a new one, but want to record an album, what do you do? You just record it in the Apple store, obviously. Prince Harvey is an LA born rapper, now living in New York and that’s exactly what he did. It wasn’t my plan to record this at the Apple Store. First, my computer died. Then my external [hard drive] died… New York is expensive. I couldn’t just buy another laptop. I just thought, ‘I’m going to die before anyone knows I’m hot. Yup. He recorded the at the SoHo store, saving things in the trashcan, because the computers get wiped at the end of every day, and this meant he could bypass the staff getting rid of his tracks. His album is named PHATASS. 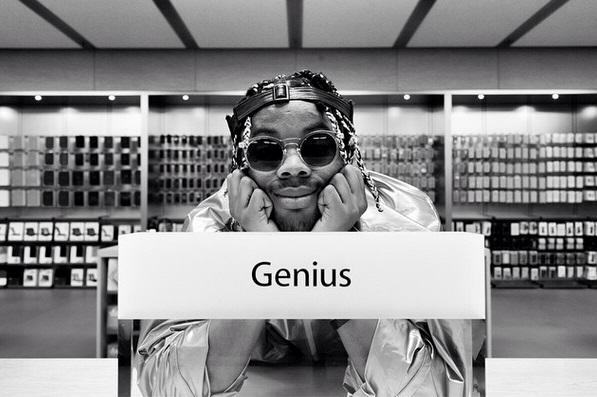 It’s an acronym for Prince Harvey At The Apple Store Soho. Brilliant. The songs were made with no instrumentals whatsoever, and are made up of just his voice and claps. Which makes it even more intriguing. The album is due to be released on July 27th, and it quickly gaining a lot of attention.